The patriotic Civil War token known as Fuld 97/389fo is struck over an 1854 Liberty Seated dime. This was issued in 1863, by which time Fort Lafayette, abbreviated as FORT LAFAYE on the headband, had been in operation for two years. In Patriotic Civil War Tokens, by George and Melvin Fuld, the illustrated token is 97/389fo, struck over an 1854 dime. The suffix letter f indicates silver metal, and o indicates it is overstruck. Most tokens of this die combination are 97/389a, the a indicating struck in copper. During this time Civil War tokens were enthusiastically collected by numismatists, and a few of them commissioned the coiners to create rarities, such as this silver strike. The obverse has MILLIONS FOR CONTRACTORS, and on the reverse NOT ONE CENT FOR WIDOWS. The headband is inscribed FORT LAFAYE, short for Fort Lafayette. The issuer of this token protested federal policies and scandals of the era—probably the most dramatic of such in the Civil War token series. The fort was built on Hendrick’s Reef, a small island in the Narrows of New York City Harbor. Construction began during the War of 1812, under the name of Fort Diamond. It was made of stone with a center courtyard and had two levels of openings or windows on the sides, with chimneys protruding from the peaked roofs that covered the quarters on various sides. Completed in 1818, the structure was renamed Fort Lafayette in 1825 during the return visit of the French hero of the American Revolution to America. Forti ed with 72 heavy cannon it guarded the approach to the harbor. 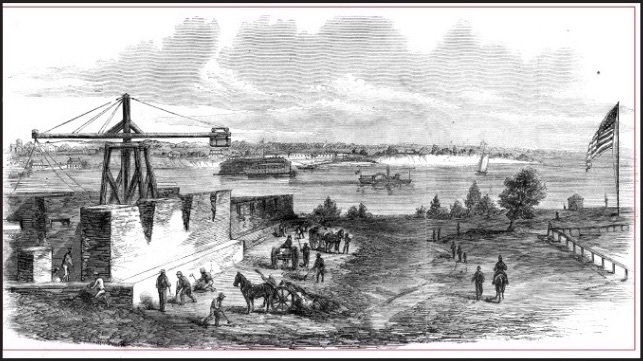 Many dissidents to the Northern cause were imprisoned in Fort Lafayette during the Civil War in what many complained were overcrowded, unhealthy conditions. During the war the largest number of prisoners at any one time was 135, of which on at least one occasion, 119 were civilians. Those conned included newspapermen who were viewed as disloyal, privateers for the Confederacy, former Union Army o cers who defected to the Southern cause and who were captured, defrauders of the federal government, and a category known as “Maryland prisoners.” The latter included the police commissioners of Baltimore, the entire City Council, Mayor George William Brown, members of the Maryland State Legislature, and others who were viewed as being dangerous. Among them was Francis Key Howard, a grandson of Francis Scott Key, editor of the Baltimore Exchange. His sin was writing an editorial criticizing Lincoln’s suspension of the writ of habeas corpus.At the time and the imposition of martial law. The affections of certain Marylanders seemed to waver between North and South. In a sad footnote to American history, the prisoners had no judicial process of any kind. On November 25, 1864, a group of Confederate men set fire to certain buildings in New York City, in retaliation for General William Tecumseh Sherman’s destruction of most of downtown Atlanta. Robert Cobb Kennedy, earlier a captain in the 1st Louisiana Regular Infantry, was the only one caught. He was imprisoned in Fort Lafayette without judicial process and was hanged on March 25, 1865, two weeks before the end of the war. In 1868 a fire destroyed many of the fort’s facilities. It was rebuilt as a storage facility, and during World War II ammunition was store there. The fort was destroyed in 1960 during the construction of the Verrazano-Narrows Bridge when the base of the tower on the Brooklyn side was built there. 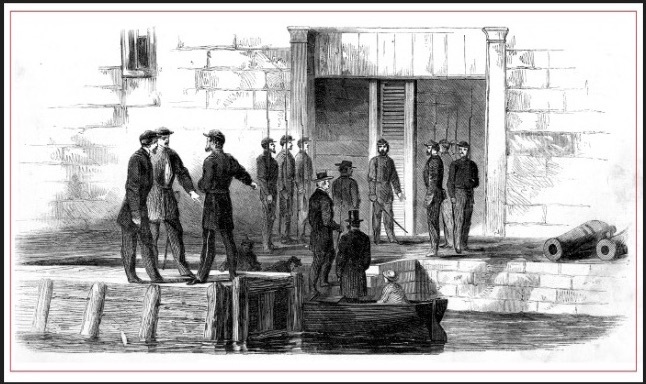 Prisoners being brought to Fort Lafayette in September 1861. Fort Lafayette, named by some the American Bastille, is not a Bastille at all, in fact the fort is more like a hotel than anything else, where the proprietor is rather strict and has a wholesome dread of fire, insisting upon all lights being out at 9 o'clock. Beyond that, the fare is excellent, and the view of the ocean extensive. Lately there has been quite a number of prisoners released; they, in secret, have told their friends, who, in turn, told our reporter in secret, consequently he is thus enabled to tell the readers of the Times what the prisoners in Fort Lafayette eat, drink, and do. Upon the arrest of the prisoner, he is delivered to Lieut. Col. Burke, commanding Fort Hamilton, and after examining the order of commitment, he is placed in charge of a file of soldiers, with the o cer of the day, and carried, by means of a boat, to Fort Lafayette, formerly Fort Diamond, directly opposite Fort Hamilton, and at the distance of one quarter of a mile. On his arrival at Fort Lafayette; he is delivered to the charge of Lieut. Wood, commanding that post. All the money from his person is taken by the commanding officer, and a receipt given for the same. He is then introduced to his quarters, which are situated on the ground floor, in one or other of the casemates, in which the prisoners sleep. If he has means to procure the delicacies of the market, the Ordnance-Sergeant attached to the port is allowed to purchase all that he desires upon a requisition made by the prisoner upon the Commander for the money. The prisoners without means or friends live upon the rations which are distributed to the common soldier, viz. ; pork, beef, potatoes, rice, and coffee twice a day; this constitutes the ordinary fare. The facilities for cooking are, however, very bad, and it is not infrequent that the food is only partially cooked when served upon the table. The men taken from the privateer vessels are still in shackles, and are con ned during the day and night under strict guard. They share the same food as the soldiers of the fort. Their situation has been made comparatively comfortable by the kind liberality of Mrs. Gilsey, of Fort Hamilton, who furnished them with clothing, aided by the prisoners of the fort, who are in better circumstances. Two hours each day is allotted for exercise in the open area of the fort. One hour, from six to seven, and one from five to six. The prisoners retire to their rooms at dark, the lights are all extinguished at nine o'clock, and the strictest military regulations are enforced a er that hour. The doors are unlocked at daylight. Shortly a er the morning papers arrive, and a free and uninterrupted discussion of the news of the day is canvassed. They amuse themselves during the day by exchanging visits from casemate to casemate, smoking cigars, playing whist, chess, back-gammon, &c., but no gambling. A few of the prisoners are permitted to see their wives and families, and every comfort consistent with the regulations and safety of the prisoners, is always promptly and cheerfully rendered by the commanding officer. 1. Weed, an influential newspaper publisher, was a close friend of Edwin Stanton and Abraham Lincoln. He protested certain actions and conditions at the fort. The Civil War Token Society Library has received a generous donation from Rick Irons of "Civil War Sutler Tokens & Cardboard Scrip, 2nd edition", by David E. Schenkman, edited by Rick W. Irons. Specialization is the word. There are excellent and commendable reasons for specializing in coins, medals, paper currency, etc. Specialization fills in the hours of leisure and creates a treasure that is a pleasure. It gives real joy to the pursuer, and is fascinating in the extreme. It furnishes rest and recreation a er work, invites study, and brings information. It causes diligent searching for many hidden treasures, and trains the eye to more acutely discern. It furnishes a more limited field for the advanced collector than does collecting in a general way. Let the senior collector try specializing in some particular series of coins, medals, or paper money along well-de ned lines and then judge for himself if the result is not more satisfactory and more educational than when but little care is exercised in collecting. Specializing should be made by the collector who takes a genuine interest in what he is doing and willingly puts much personal work into it. He should mostly purchase from personal knowledge.